Do you still remember Bucs’ Super Bowl win? Success came like a shooting star ripping through the night sky. It had been dark, and suddenly, there was this fascinating light, jagged across the horizon. For just a moment, it made things a little brighter. It filled us with wonder and awe, and somehow, it made us feel better about ourselves. It has been more than 15 years now since the Tampa Bay Bucs won their Super Bowl, and the team hasn't managed a win in the playoffs since. That team, one that was built to win three or four championships, won just that one with a 48-21 drubbing of the Oakland Raiders. And it was amazing. 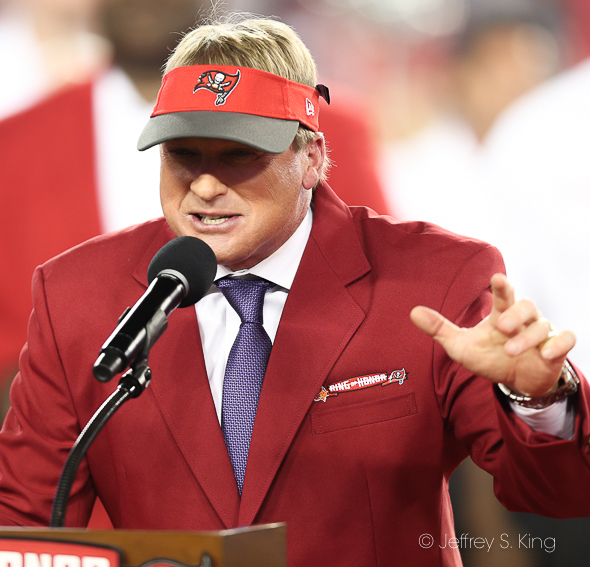 Bucs fans, downtrodden for so long, suddenly walked with a swagger. They were Warren Sapp with his swagger, and Derrick Brooks with his speed, and Ronde Barber with his instincts, and John Lynch with his toughness, and Joe Jurevicius with his focus, and Brad Johnson with his efficiency. They were an offensive line held together by bailing wire and spackle. They were overachievers like Mike Alstott and Keenan McCardell and Greg Spires. For one brief, shining moment, they were ours. I was thinking about that Bucs team this week. It has been so long, and the memories are so distant, that I wondered just how many of the current Bucs' fans were alive to remember. Recently, Bleacher Report talked about the great defenses of all time. They had that year's Bucs at fifth, which is certainly a compliment. But if you expand that era -- and I have -- the Bucs rank a lot higher. I once broke down the great defenses -- the Bears, the Chiefs, the Ravens -- for a decade. Only the old Pittsburgh Steelers had 10 seasons in a row that could compare with sacks, opposing quarterback ratings, passing defense, rushing defense, points allowed, etc. As far as the Super Bowl, however, the Bucs won it once. Just once. Oh, to some, that was enough. After all, Buffalo has gone to the Super Bowl four times and lost them all. So has Minnesota. Cleveland and Detroit have never won one (nor have Jacksonville or Houston). The Bengals, Falcons, Panthers, Chargers, Cardinals and Titans have never won a Super Bowl. In the case of the Bucs, that Super Bowl season was special because of the contrast of most of the team's history. Remember, this team had been awful. It was the team of Booker Reese and Charles McRea and Eric Curry, of Vinny Testaverde and Lars Tate and Keith McCants. It was forever lost. Someone put out a highlight tape of that season and didn't mention the bad old days. I wrote that it was like tellling Cinderella's story and leaving out the part where she was a servant. Ah, but who is the best team to have won it only once? Which teams can you look at shake your head and think "there was more there." I know. It's being greedy. Neil Armstrong walked on the moon only once. Still, there were teams that were so good, history is still puzzled that they didn't win for a second time. 1. Chicago Bears: The Bears won it all in 1985 with the most dominating defense of a single season in NFL history. They had Dan Hampton and Richard Dent and Mike Singletary and Wilber Marshall. Offensively, they had Walter Payton. And they won it one time. Over a five-year period, they won 62 games. But only one Super Bowl. 2. Seattle Seahawks: If they had been smarter, the Seahawks wouldn't be on this list. They were within inches of a second Super Bowl win when the coaching staff got a collective brain cramp and threw away a victory at the goal line against New England. Looking back, a team with the Legion of Boom, Marshawn Lynch and Russell Wilson deserved more. 3. Tampa Bay Bucs: The Bucs' 2002 season highlighted a golden age for the team. It could have won in 1999, and it had a shot in 2000 if it could have held onto a lead late in the regular season against Green Bay. But the Bucs' offense never caught up to the defense to allow a dynasty to occur. 4. St. Louis Rams: The Rams were the flip side of the Bucs. They had great offenses, but they were never able to play enough defense to take full advantage. They did make one great defensive play, however, stopping Tennessee just short of the goal to win the big one. 5. Indianapolis Colts: The Colts, under former Buc coach Tony Dungy, always seemed to be on the verge of winning the Super Bowl under Peyton Manning. They finally managed in 2007 (the 2006 season) when Dungy played former pupil Lovie Smith. (No, the old Baltimore Colts don't count as the same franchise). 6. Kansas City Chiefs: The Chiefs have stuffed the Hall of Fame, which is odd considering they didn't even win their division in 1969. Still, that defense was a force with Willie Lanier, Curley Culp and Emmitt Thomas. It never happened again. 7. New Orleans Saints: Drew Brees has always given the Saints a shot at the big prize, but he's won it only once. The Saints are another team that just hasn't been able to close because of an average defense. 8, Philadelphia Eagles: The Eagles are the reigning Super Bowl team, which means they haven't had a chance to repeat, yet. But Philadelphia came from humble beginnnings to win last year's game behind backup quarterback Nick Folk. 9. New York Jets: The Jets won the most memorable upset in Super Bowl history in 1968. Since then, they've watched other teams win it. In some ways, they seem farther from the Super Bowl than ever. Ahhhh, the memories of that 2002 season still give me a thrill after all this time. All those teams you mentioned ( Bucs included) are one hit wonders! Their wins were products of a perfect storm scenario. I was not an NFL fan at all until I got out of the Army in ’65 but I have been a Bucs fan from day one. Before that I was a Dolphin fan when they were the only NFL team in Florida and before that a Steeler fan because I liked Bradshaw and I was in the Steelworkers Union at the time. I honestly think the Bucs have had their one window of fame and I will probably never see them in the big show again in my lifetime. I can still dream though . Don’t we all ? That team should have won three. Ah, if they ever got the offense right. When I was a kid, I was a huge Colts fan. Remember the year (’67) they were undefeated going into their final game and still didn’t make the playoffs? That would be the Baltimore Colts Unitas was their QB until ’72 I think. Great team! How did an almost undefeated team miss the playoffs? They were 11-0-2 and played the Rams, who were in the same division. The Rams won and earned the right to play Green Bay in the post-season. Previous post: Can this year’s Rays avoid last year’s slip?